i, like, all went and done grew up. can you believe it? 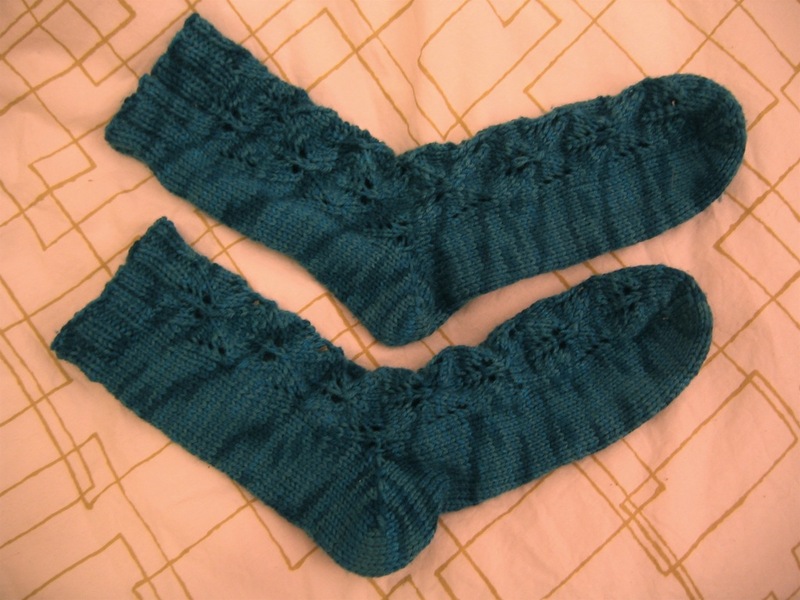 my first completed pair of socks ever. 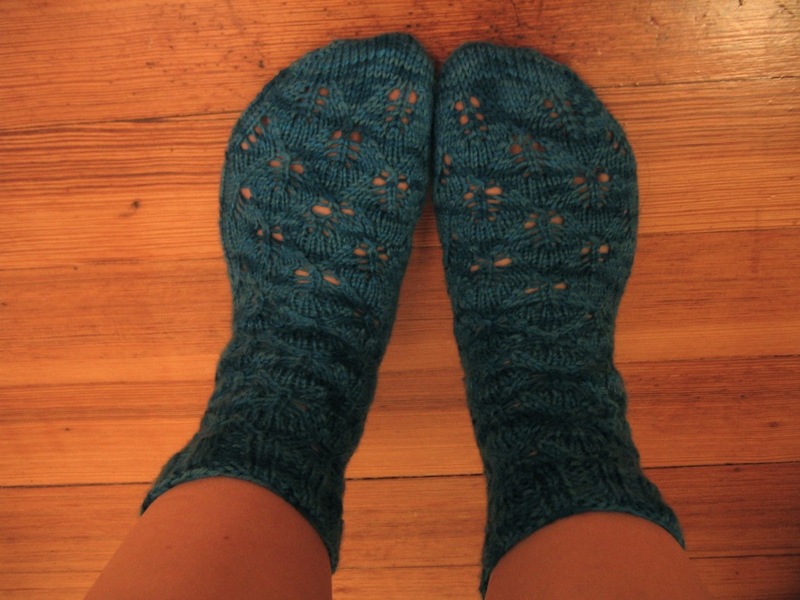 these haven’t been my first socks i’ve attempted mind you. 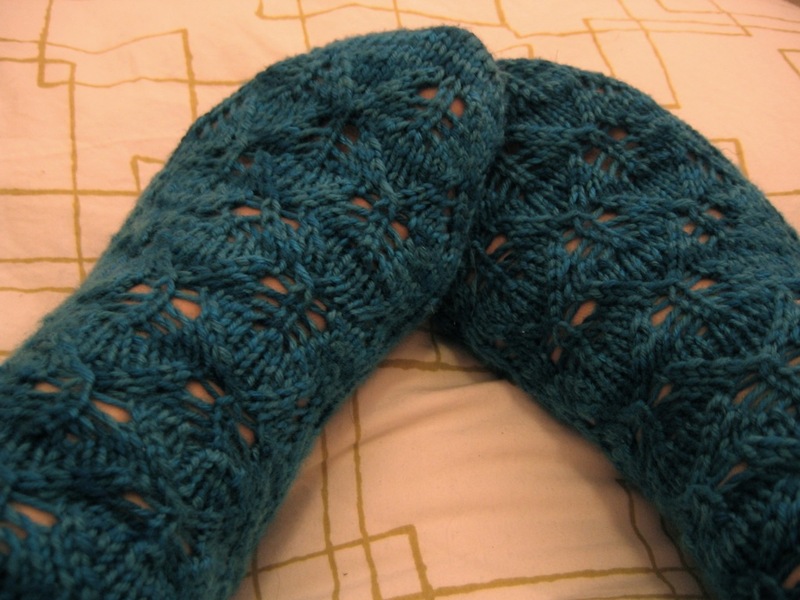 merely the first completed pair (as opposed to a loner, or an eternal WIP, or inches of circulation-cutting stitches.) how’d i do it? dirty little secrets. – worsted weight yarn. less stitches, more definition, and warmer toes. the sock-knitting equivalent of superbulky yarn. is this forgivable? i wear wigwams a lot as my defense. 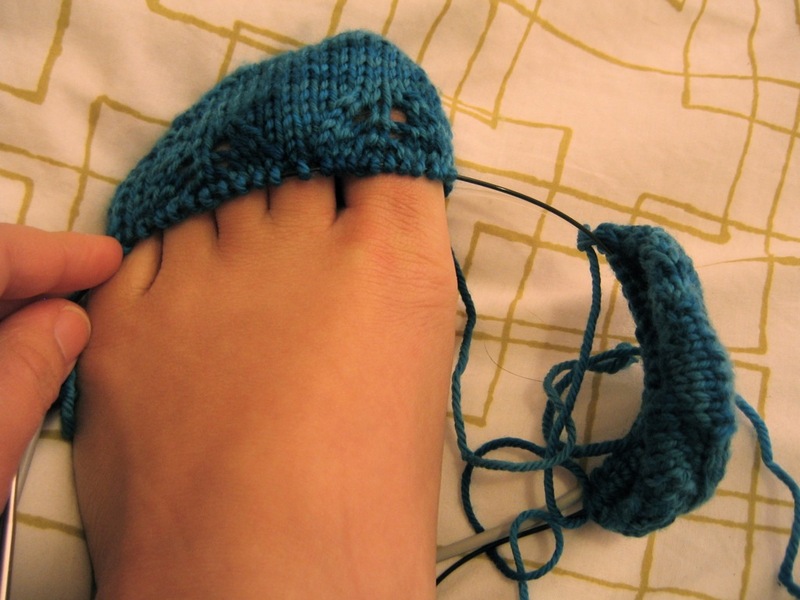 – doing both socks at once on two circular needles. die, sneaky little dpns that drop stitches, die. – a good pattern and yummy yarn. no snoring here. mods: some were intentional, some serendipitous. :) of the former, i reduced the stitches from (33 + 32) to (23 + 22). i simply did one less of the horizontal lace repeat. i also did a 2×2 rib cuff instead of the garter stitch. of the latter, i somehow did not even notice that the lace pattern is conducted around the entire leg, not just the front part, after the instep and heel are completed. i must have been obsessed with the stockinette section, as it served as a quickie oasis in the wild world of ssk’s and yo’s. 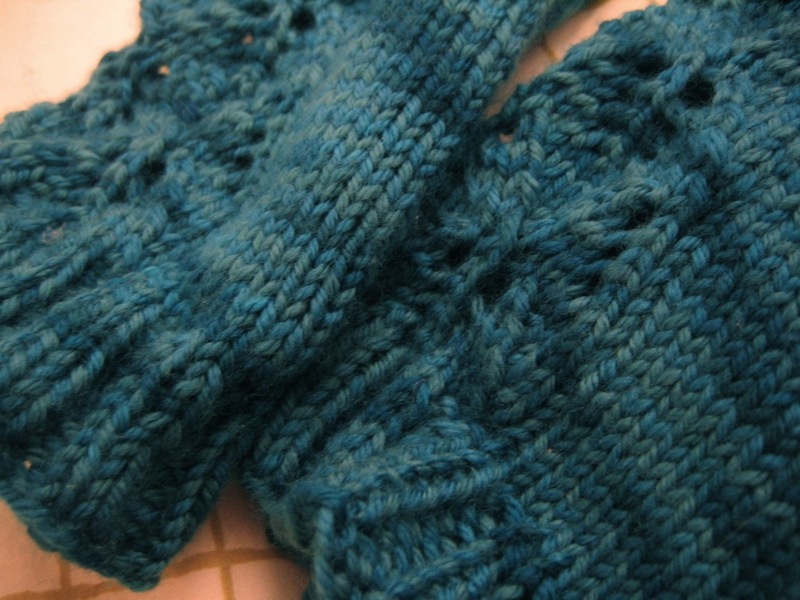 things i learned: next time i will use a decidedly stretchy bind-off. this time i bound-off with the 3 needles normally, but loosely. i should know by now that loose intentions do not translate into loose inventions. the socks are fine to wear, but they need a little extra tlc to slip them over my heel. also, i need to love the ankle gusset, and the little spot where the heel and instep and leg all meet. so much love to eliminate any holes. verdict: these are the prettiest, softest things my feet ever did see. i’ve never owned anything teal before, but the colour is perfect! >Oh, they look great! I’ve been oogling that pattern since she posted it.And don’t worry about the Art Yarns worsted. It’s my favorite sock yarn and it’s not too bulky for shoes. Also way softer than Koigu. And … just for fun … the word verification on this comment reads “vagji”. Hilarious! >Nice! 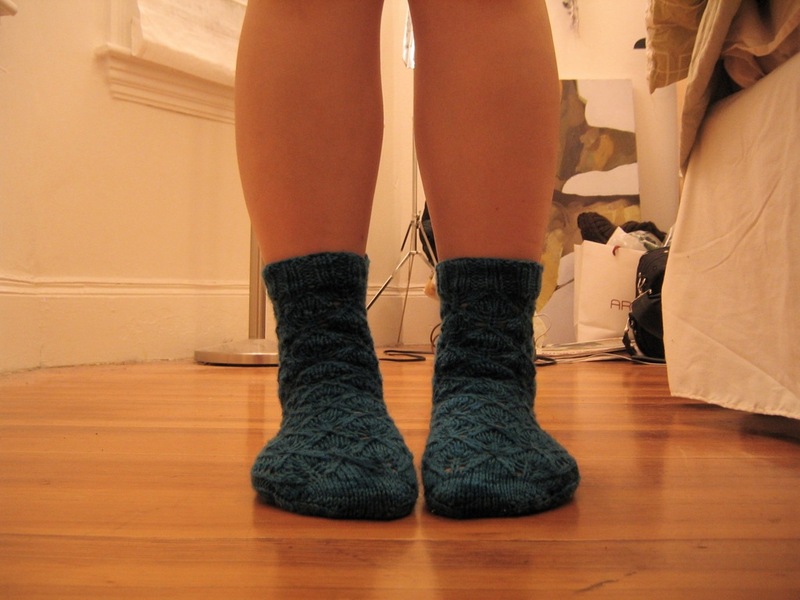 I’m planning these in Mountain Colors Bearfoot! Green, of course!